‘R… Rajkumar’, directed by Prabhu Deva, is a film so relentlessly ugly, you have to wonder how it qualifies as entertainment of any sort. To dismiss ‘R… Rajkumar’ merely as a throwback to those cheerfully low-IQ 80s potboilers would mean letting off the makers too easily, for this is cinema of the most exhausting kind. I’m going with half out of five for Prabhu Deva’s ‘R… Rajkumar’. The half star is strictly for Pritam’s music, the only bright spot in this excruciating film. R… RAJKUMAR has everything that the hoi polloi looks for in atypical mass entertainers, the problem lies in the fact that there being an overdose of masala films, one can actually foresee what’s in store next. The story is done to death, the screenplay is far from inventive and everything seems conventional. Sure, a few moments do keep you glued and hooked to the proceedings, but the waferthin plot and lackluster screenplay plays spoilsport. On the whole, R… RAJKUMAR doesn’t work. It is Prabhu Dheva’s weakest Hindi film to date!
. R…Rajkumar is ostensibly Prabhu Dheva’s first non-remake Hindi film but you’ve seen it all before: a dialogue spouting hero – his signature line is: silent hoja warna main violent ho jaunga; assorted buffoonish villains; and a heroine, Chanda played by Sonakshi Sinha, who gets tossed around between all of them. But that’s not enough to take you through the rest of this bludgeoning movie. I’m going with one and half stars. Most of the comedy falls flat on its face and drama doesn’t engage the viewers. Script is quite weak and narrative style targets only the masses and doesn’t suit the multiplexes audiences. Action scenes are made for masses and single screen audiences. This film is classic case of miscasting Shahid Kapoor. This one will not be able to recover its investment. While ‘R…Rajkumar’ entertains at some levels, it suffers from utter plainness and predictability. The raw action is impressive (Ravi Varma), the songs (Pritam) and the choreography are routine attractions. The second half seems like a sari too long and the comedy is often forced. It has some ‘Must Haves’ of a pot-boiler, but misses the real thing – a SOLID STORY! R… Rajkumar is characterised by the most absurd camera angles. The relentless close-ups are similar to those from Ekta Kapoor’s many melodramatic television shows. The director’s vision for the film is centered around proving to the audience that Rajkumar is a real (macho) man and pursues it more aggressively than the viewer would have liked.The film begins pretty well and Shahid entertains in bits but there’s only so much he can do to make this kind of stuff work. A violent action film that has been designed to give Shahid Kapoor a tough-guy makeover, R… Rajkumar is weighed down by just the kind of music-and-machismo formula that worked for Wanted and Rowdy Rathore, but has now lost its edge. Saddled with a scratchy screenplay that goes round in circles, Shahid Kapoor ends up looking more moronic than macho. The screenplay, whatever little there is of it, is mangled heap of nonsense. Logic and good taste are given a wide berth all the way through. For the film, on its part, is pure poppycock. The only place that it should be heading to is the cleaners. Prabhu Dheva, with an extra ‘h’ in his name, has designed a film that gives us everything that Bollywood doesn’t need at this point: a setting that has no roots (where is this village, who are these people? ), an atmosphere brimming with viciousness, crudity, and misogyny (the lead female part is barter between men), and a hero who stands for nothing.I was left asking, why was R.. Rajkumar made? It is nothing but blank putrid noise. R.. for Rubbish. Zero star. With R… Rajkumar, Prabhu Dheva commits his second blunder this year after Ramaiya Vastavaiya. He needn’t have made this film. The film does not leave you with a single memorable scene despite its loud effort to impress. Prabhu Dheva clearly loses track of his own film early on. The first half is a jumble and the second seems too long. 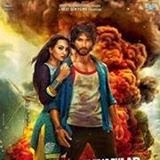 `R…Rajkumar’ is a vague attempt to produce a film with a variety of emotions, but sadly you will find no trace of any kind of emotion, not even humour. The filmmaker has failed to make even a single moment where the movie viewer connects to any of the movie characters. Watch the film only if you don’t love yourself! R…Rajkumar is unpretentious about stooping to any level to get people to like the film. Unapologetically formulaic fashioned on the typical 80s’ films which are the norm these days, it is crass with no heart to it. All through the film Shahid blabbers Pyaar Pyaar Pyaar ya Maar Maar Maar perhaps asking us to take our pick. The unanimous opinion on this one has to be ‘Maar Maar Maar’ for being the sheer noise it turns out to be! The biggest reason why R…Rajkumar is a big disappointment is that there is no surprise element in the film. One could easily predict the entire plot of the film. But director Pradbhu Dheva can’t be blamed for this let down. He made a similar film with Akshay Kumar (Rowdy Rathore) and earned over Rs. 100 crore. Like Parbhu Dheva’s other Bollywood films, this one too has a South Indian touch. Past paced scenes, quirky item numbers and a hero who could beat just anybody. Even if you are big fan of no-brainer action thriller, we would suggest you to watch R…Rajkumar on TV. R… Rajkumar’ is an incoherent movie that blatantly piggybacks on Salman Khan’s ‘Dabangg’ laurels.The main drawback of ‘R…Rajkumar’ is its wobbly plot. The characters appear and disappear at random, and shift loyalties without reason or logic. And, every possible genre – whether comedy, action, drama, romance – finds a part in the plot. His dance moves, one that he even steps in to do, are mind-blowing, but his movie, unfortunately just doesn’t match up.